I’m not sure about the weather in your neck of the woods, but I think spring has sprung in our area. We’ll still experience some cooler temps, but the sun is shining more and more each day and the trees and flowers are already in bloom. When I think of spring, I think of a fresh, new start of my most favorite season and I dream of all the beautiful blooms that will be peeking through the ground and leaves. And, I love using flowers in my crafts even more. They can bloom anytime and through any season. The first flower was inspired by last week’s mix & match challenge. I used a rainbow of Doodlebug Design papers I had lying around. I piled them in the order in which I wanted my flower. Using punches in my collection, I punched shapes --- the circles, a scalloped circle, a medallion and a sun. Once you’ve punched the shapes you want, lightly ink the edges. This will add a bit more dimension and definition to each layer. Stack the shapes from bottom to top and pierce through center of each layer. Add a colorful brad. Cut two leaf shapes from Petite Prints and adhere to back of flower with glue/glue dot. Very simple, but very cute and colorful, flower. The next flower uses Colorwheel Collection - Pocket Full o’ Posies as the base for the flower. I originally thought I’d use the sunshiney yellow, but opted to alternate the colorful flowers and the yellow printed paper. Gather your supplies ---- Doodlebug Design paper of your choice and a sheet/piece of green, a Paper Frills border and a black velvet brad. Punch five scalloped circles. Stack in order desired. Pierce through center of all circles and add brad. Now is the fun part of shaping your flower. Lift edges of first circle and crinkle the paper, pulling upward slightly. Repeat that crinkle process for the next three rows, too, leaving the bottom circle fairly flat. When all circle / petals are crinkled, the flower will be full and resemble a mum or carnation. Cut leaves from green paper and adhere to backside of flower. • Layer a brad through buttonhole of boutique button. Add handcut paper leaves [or use a heart sticker to mimic leaves]. • Punch circle. Use a Fancy Frills sticker border and shape into circle. Add boutique brad. I found it easiest to use the loop or scalloped borders for these flowers. 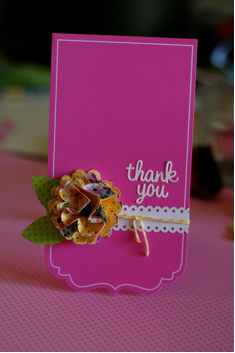 • Use Paper Frills and roll into flower shape. • Use doodle twine in circle to make a lollipop / stylized flower. • Punch circle for base. Add adhesive or glue dots to circle and loop twine back and forth to make petals. Top with another punched circle and embellish. • Place four or five heart stickers in circle, points of heart to center. Add brad. • Use doodle twine to make pom-pom flower. Now, grab some Doodlebug products and make your own gardenful of colorful blooms! If you make any of the flowers from, or inspired by, this tutorial, please let us know in the comments or on our facebook page. Very cute and the tutorial is great too! so cute!! thanks for the tutorial. I love to try this out.